Dear Hobo - what is the best food for bearded collies. I don't have a perfect food choice to provide you. If you are starting out with a new puppy, I recommend that you ask your breeder. As your Beardie gets older, his diet requirements will change - once again, your breeder can help you choose the correct diet. It is important to remember that dogs can have allergies to certain foods - so as always consult your vet or breeder if you see anything unusual (diarrhea, excessive scratching, hot spots). Your dog will benefit from dry dog foods. The abrasive action of dry foods helps keep his teeth clean. 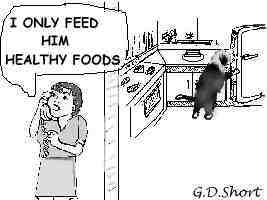 A good quality dry food and a bowl of water is all that your best friend requires. OK, OK, I know... I am famous for my eating habits. You may ask, is it OK to feed your pooch some human food. If you ask me for my opinion, I say sure. Just keep it in moderation and watch out what you give your dog. Small bones can splinter or get caught in your dog's throat. Its your choice if you add human food to your dog's diet, maybe an occasional piece of chicken or beef. But remember, once you start you may be begged for more. This type of food is a treat. Some experts have suggested up to 70% human food in a dog's diet. BUT - you have to know what you are doing! If you want to feed human food - read up. You have to balance the diet and this requires knowledge. Good brands of dog foods are balanced diets. Personally, since we wrote this article way back in '97, we have found our favorite food for our Beardies. We have totally gone over to a natural kibble. There are several of them out there. Our choice is Inova, or California Natural. But you can check them all out in a similar manner that we did. We started by going to a knowledgeable feed store that carried many of the premium brands (not usually found in pet stores and ever in grocery stores). We then looked for those brands that had the right protein level for our breed - 23% is about optimum. Then conducted a taste test. Our own goal was a human quality standard, plus a food that had no chemicals as preservatives and such. We have studied up on the foods, as you can also. We avoided allergens like soy, corn, wheat and certain meats we know our Beardies were allergic to (oddly in our case it was lamb that caused problems). Chicken or turkey seemed best for us - as we have also found with many others. And the rice is not highly processed and bleached. We also wanted Omega 3 and 6 fatty acids, which are good for skin and coat, as well as having some long term benefits being reported (and natural source). Need more information? Go back to my home page and look for the BeardieList button, join, and ask some of the most knowledgeable people on the net.